Inside Edge│ EdgePoint Wealth Management Inc. Inside Edge is dedicated to providing a collection of investment-related charts, articles and musings that have hit our desks or inboxes. Once in a while we will post materials we’ve created and glimpses of EdgePointers’ lives. Get the Edge - Click here to view an archive of investment education, daily musings, book recommendations and more. In 1990, a strange new German family-owned grocery chain named Aldi entered the UK market. It only stocked 600 basic items, all at very low prices. This would have shocked the average shopper in Britain who was accustomed to thousands of products and brands, vast fridges and aisles piled high with fresh fruit and vegetables. Most people were confident Aldi would fail in the UK, where there was discernible snobbery about discount stores. In the 1990s Aldi focused on building slowly and steadily and remained in the Midlands and the north of England, where store rents were cheaper, and the customers less affluent. Aldi is a private company, with no shareholders other than Karl Albrecht’s family to answer to, so they could afford to take their time. Staying privately owned allowed Aldi to be unburdened by the short-term pressures for profits faced by its publicly traded rivals. Up until 2008, Aldi was still considered a niche UK retailer, locked out of the mainstream market. This all changed when the great financial crisis hit in late 2008. Inflation rose above 5%. Companies laid off staff. Household incomes were squeezed and the big grocery chains in the UK actually raised their prices in line with inflation to try to maintain their profit margins. People were forced to try discounters like Aldi. For Aldi, the timing was perfect, as it was just reaching critical mass in the UK. It had about 400 stores, and an established network of manufacturers delivering products that were not only low-price, but also of reasonable quality. This new phase of rapid growth was inevitable, and Aldi’s managers believed the financial crash brought it on sooner than expected. Today, Aldi is still growing and is now UK’s fifth largest retailer with over 7.5% market share. Aldi also has 12% of the market in Australia and 2% in the US with plans to raise its number of stores in the US from 1,800 to 2,500 by 2022, which would make it the third-biggest chain in the US by store count, after Walmart and Kroger. The story of Ms. Murakami taking on the business establishment in Japan is remarkable. Her father Yoshiaki Murakami, a well-known bureaucrat turned activist investor, taught her the value of money by making her bet on the cost of dinner. Today Ms. Murakami runs C&I Holdings, a family fund that enables her to influence how Japanese executives run their companies. Her approach is uncompromising. “Whether I am female or young, I still hold the same number of shares and I can exercise them.” Activist investors like Ms. Murakami are helping to accelerate change in Japan’s corporate culture. Business in Japan has long been an old boys club defended by yes-men with up to half of listed firms shares in the hands of friendly shareholders (mostly banks and insurance firms who tend to support managers). Change in Japan’s corporate culture will not happen overnight but Japan’s current prime minister, Shinzo Abe has enacted new laws as part of his economic-growth strategy to challenge hoary boardroom practices, with the aim of promoting American-style shareholder capitalism. This transformation in Japan is occurring just as US politicians such as Elizabeth Warren argue for a model that looks decidedly Japanese. Seeing the world around you may not be good enough to understand how it works. You have to actually experience it to learn how to operate in it. MIT scientists tested two of cats. The two cats grew up seeing the same thing. But one actually experienced real world conditions while the other merely viewed it. Once the two cats were both brought back to normal conditions the cat who only watched leaped towards the steep ledge and fell straight off. It also failed to blink when an object accelerated towards its face. It couldn’t associate visual objects with what their bodies were supposed to do. The cat that experienced the real world was normal and the other was effectively blind. One of the most important topics in business and investing is whether all of us are, in some ways, like these blind cats. Sure, we’ve read about the Great Depression. But most of us didn’t live through it. Can we actually learn lessons from it that make us better when investing? In theory, people should make investment decisions based on their goals and the characteristics of the investment options available. But that’s not what people do. Research shows that people’s lifetime investment decisions are heavily anchored to the experiences they had with different investments in their own generation. For example, Investor Tren Griffin wrote that he gained a lot of muscle memory that resulted from the Internet bubble. "There is no way you can fully convey in words the experience of being in the lead car as an investor in that roller coaster. Looking at the cycle after the fact is nothing like looking ahead and not knowing what will happen next. The experience still impacts the way I think and act today." What we see or read every day skews our perception of the world and makes us believe things are getting worse and worse every day. Threatening negative news passes much more easily through our mental filters then the good news. Another problem is good news or positive progress is gradual and won’t make for good headlines. The truth is things are unquestionably getting better over time. To help understand the transformation in living conditions here is a visualization from Our World in Data. 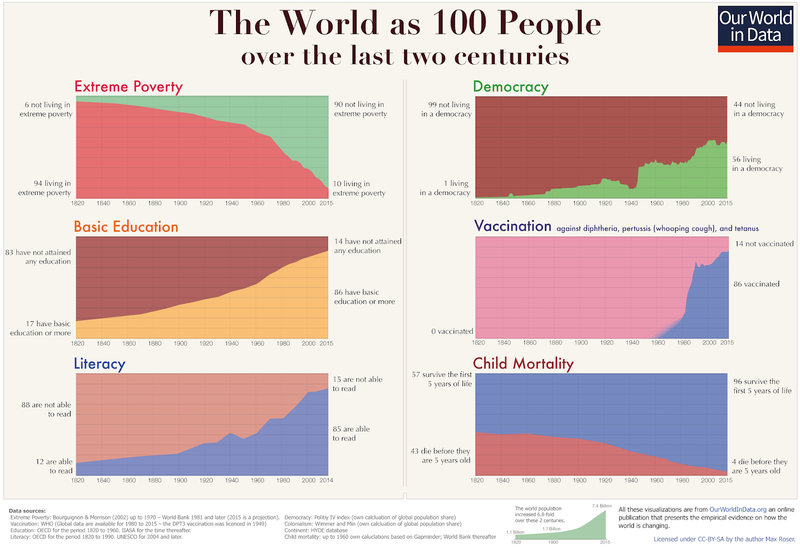 This chart shows how the lives of 100 people would have changed over the last 200 years if they lived through this transformative period of the modern world. In 1820, 94% (94 of 100 people) of people in the world lived in extreme poverty. Today, that number is close to 10% (10 of 100 people). Another example – In 1820 only 12% (12 of 100 people) could read. Today that number is over 85% (85 of 100 people). Does 2019 look similar to 1999? 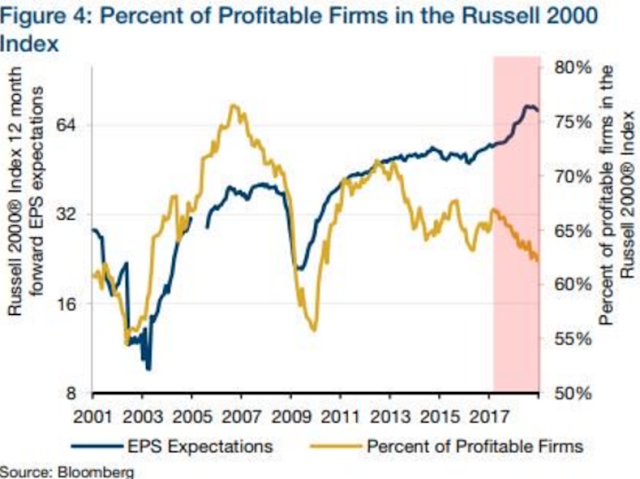 An increasing percentage of Russell 2000 companies are unprofitable. 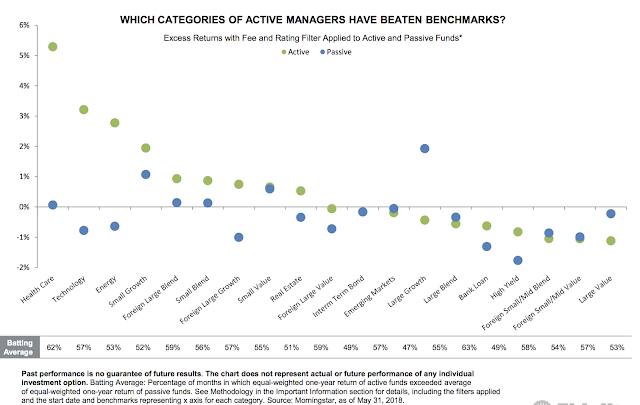 A recent study published by Fidelity shows active management beats passive in 12 of 18 investment categories (one category tied). This week we celebrated Kris’s fifth and Teddy’s first anniversary! Is market volatility a fee or a fine? Fees are something you pay for admission to get something worthwhile in return. Fines are punishment for doing something wrong. It sounds trivial, but thinking of volatility or drawdowns as fees instead of fines is an important part of developing the kind of mindset that lets you stick around long enough for compounding to work. A reason market declines hurt and scare so many investors off is because they think of them as fines. The natural response for anyone who watches their wealth decline is to avoid future fines or market declines. But if you view volatility as a fee, things look different. Returns are never free. They demand you pay a price, like any other product. And since market returns can be not just great but sensational over time, the fee is high. Declines, crashes, panics, manias, recessions, depressions. The trick is convincing yourself that the fee is worth it. That, is the only way to deal with volatility; not just putting up with it, but realizing that it’s an admission fee worth paying. Since 2009 there have been numerous headlines telling us that the easy money had been made. Avoiding this market noise and staying invested through the drawdowns was hard. Only in hindsight does it look easy. Jamie Dimon released his annual letter to shareholders sharing his insights on some critical issues currently churning in the United States. Jamie speaks up for capitalism, stock buybacks and big business. "There is no question that capitalism has been the most successful economic system the world has ever seen. It has helped lift billions of people out of poverty, and it has helped enhance the wealth, health and education of people around the world. Capitalism enables competition, innovation and choice." "We much prefer to use our capital to grow than to buy back stock. 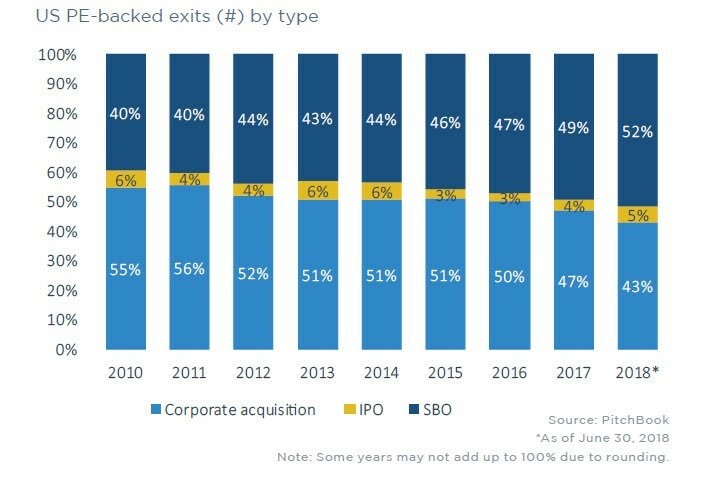 We believe buying back stock should be considered only when either we cannot invest (sometimes as a result of regulatory policies) or we are generating excess capital that we do not expect to use in the next few years. Buybacks should not be done at the expense of investing appropriately in our company." Executives at Berkshire subsidiary companies now gather regularly to share strategies and best practices. Enrollment in two-year, full-time MBA programs in the U.S. fell by more than one-third from 2010 to 2016 and in 2018, applications to business schools in the U.S dropped 7% from the previous year. The rapid rate of technological change, a booming job market, and the digitization of education are chipping away at the traditional graduate-level business program. To meet today’s business needs, startups and massive companies alike are increasingly hiring technologists, developers, and engineers in place of the MBA graduates they may have preferentially hired in the past. With disruption to the advanced business education system already here, some business schools are applying notes from their own innovation classes to brace for change. We’ve seen schools with smaller MBA programs shut their doors in favor of advanced degrees with more specialization. Over the past decade, enrollment in specialized graduate business programs doubled. Apprenticeship models are reemerging as an effective way to train tomorrow's leaders. Craft beer was born in the mid-1960s, when an heir to the Maytag appliance fortune bought a San Francisco brewery called Anchor and began marketing a full-flavored, malty beer as its flagship. Today, there are 7,000 small, independent breweries in the the U.S, the most since pre-Prohibition days. You might think, based on this, that the people have spoken; that Small Beer has won. You would be wrong. For the past decade, Big Beer has been systematically buying up the craft breweries they couldn’t beat, and Anheuser-Busch InBev (ABI) has led the way. ABI’s acquired craft brands tend be pretty good at making “liquid” that drinkers want, but ABI is really good at the rest. ABI’s “go-to market” machine is a marvel that gives it remarkable influence over how and where its brands are sold and whether other brewers’ stuff is sold at all. ABI can box out rivals from retail shelves, tap towers, even entire stadium concessions. Saputo Inc. has little name recognition outside of Quebec (the company spends very little on marketing), but it has quietly grown into one of Canada’s top international success stories. With 62 plants on 5 continents and expected sales of more than $13 billion this year, 70% of which come from outside Canada, it is among the largest dairy processors in the world. For close to 50 years, Canada's supply-managed dairy industry, which shields farmers from international competition through a mix of quotas, tariffs and price controls, has defied every effort at reform. The election of Donald Trump changed everything. Trump quickly drew a large bullseye on Canadian dairy, repeatedly flaying the country for “what they've done to our dairy farm workers". Saputo has no regrets about breaking with the dairy lobby on the issue, calling their arguments “propaganda”. For a company like Saputo that wants to continue to grow they have to think about markets outside of Canada. With everyone diving in to private equity, future returns may not be as attractive as in the past. Yet the $358 billion California Public Employees’ Retirement system fund (CalPERS) believes it has a competitive advantage. Today, CalPERS has nearly $28 billion, or 8% of assets, in private equity holdings and over the last 10 years, private equity was CalPERS best-performing asset, returning an average of 9% annually, compared with 6.7% on public stocks. CalPERS now believes it may be able to continue this success and on March 18 voted to funnel up to $20 billion more into private equity over the next 10 years. CalPERS plans to partner with elite private-equity managers, that will make them their sole client. That way, CalPERS would have better control and more transparency to make better investment decisions. The chief investment officer (CIO) of CalPERS believes more private equity is needed to increase the fund's probability of success. In January of 2018, Mexican regulators eased restrictions on how Mexican pension funds invest their assets. This change allowed foreign private equity managers to tap into the $179 billion worth of pension fund assets for the first time in Mexico. Over the last year many of the world’s top private equity managers have quietly raised billions of dollars from Mexican pension funds. Well-known names like BlackRock was one of the first foreign asset managers to expand into Mexico, raising $615 million for two funds. Blackstone Group has now also raised $695 million from Mexican pension funds for its first two local private equity funds. 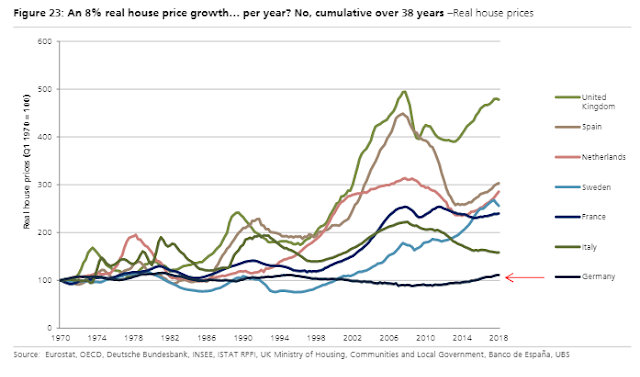 Germany’s mortgage market saw little growth in the past 18 years. Germany's mortgage market was equivalent to 40.5% of GDP in 2017. This is not surprising as Germany has one of the lowest home ownership rates in Western Europe at 51.9%. Looking at the Canadian mortgage market we see a different story. The Canadian mortgage market expanded from 39% of GDP in 2000 to over 68% of GDP in 2017. Every day media outlets try to tell investors how the markets are doing. This question commands far too much attention given how little it actually matters in most people’s day-to-day lives. 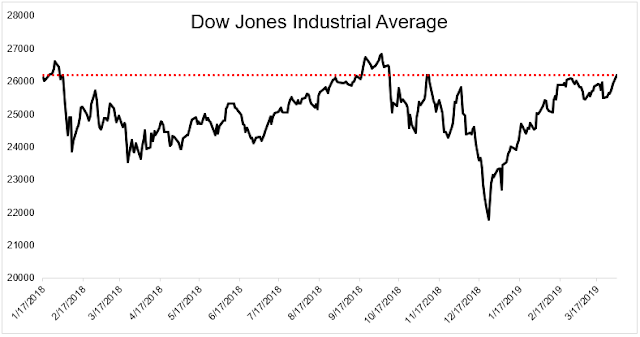 Since January 17, 2018 the Dow Jones Industrial Average has seen absolute daily changes add up to over 58,000 points. 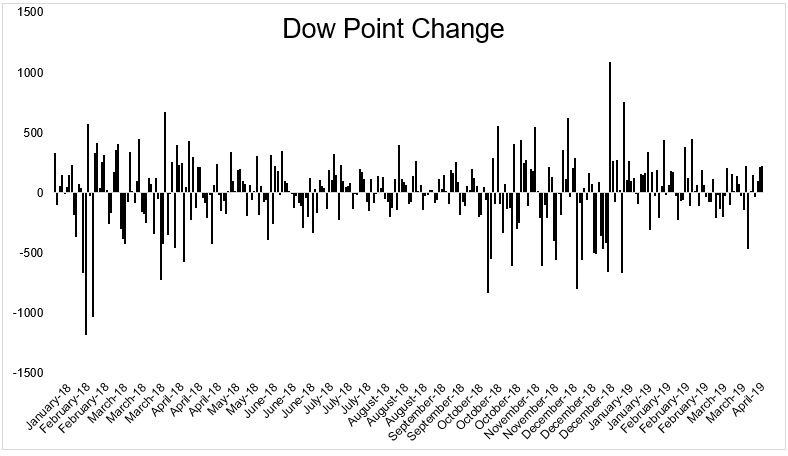 Yet over this time, the index has gained less than 100 points. 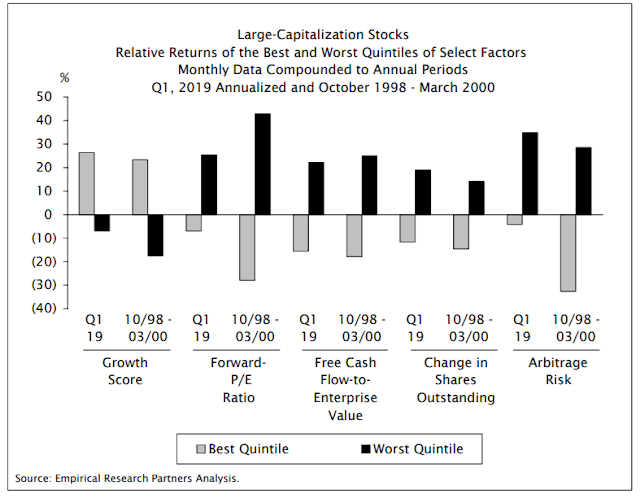 Most assume picking the big winners is the key to outperforming the market for a stock-picker, but it’s likely more important to avoid those distressed stocks that can be so damaging to performance. Since 1980, over 320 companies were removed from the S&P 500 for business distress reasons. 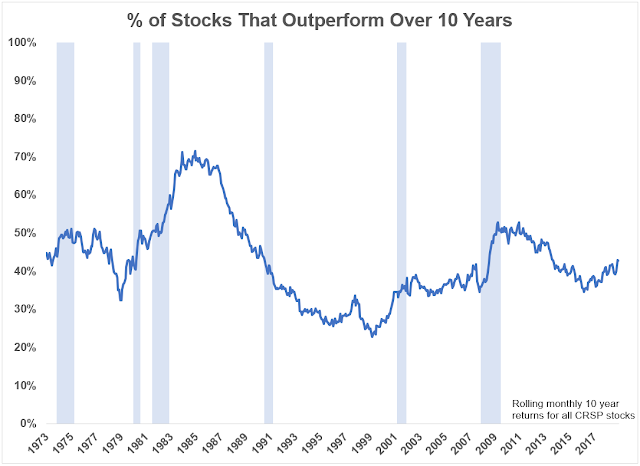 How many individual U.S. common stocks outperform the S&P 500 over rolling 10-year periods? On average 43%. You can see the number got as high as 70% in the 1980s and as low as 25% in the late 1990s. Joel and Allie celebrating their 5th work anniversaries! This website is for informational purposes only and does not constitute an offer to sell, a solicitation to buy, or a recommendation for any security, nor does it constitute an offer to provide investment advisory or other services. Nothing contained on the website constitutes investment advice or offers any opinion with respect to the suitability of any security, and the views expressed on this website should not be taken as advice to buy, sell or hold any security. This information has no regard to the specific investment objectives, financial situation and particular needs of any specific recipient of this information and investments discussed may not be suitable for all investors. All information is subject to possible correction. Information may quickly become unreliable for various reasons, including changes in market conditions or economic circumstances. The website receives commissions from affiliate links on Amazon.